Previous modules in this series have addressed personality traits (#1), relational drama (#2), and maintaining consistent feelings of self worth (#3). This release brings focus to the negative impact of worry in the client's life. As with Dave's previous releases, you'll draw a diagram for the client that will pictorially give him/her scientifically proven strategies for managing any anxiety s/he might be feeling. By watching the video first you'll share in the experience that the client will have. By then reading the printed document you'll receive even more information to help you flesh out the reading to fit your own style. By the end of the reading, the sitter will inevitably begin to share with you the specific worry(ies) you'd been sensing. 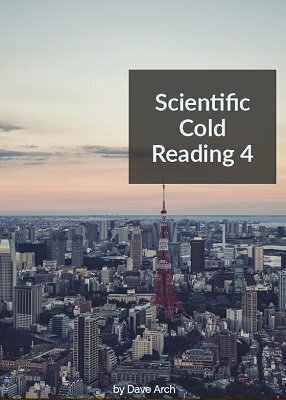 Substantive cold reading information has been the hallmark of this series from corporate executive coach Dave Arch. 1st edition 2018, PDF 3 pages, video 2 min 47 s.